New set of skins for the Prime emulator, designed for Firmware 11226. Includes two horizontal versions and one vertical version, each with five color variations, plus an additional vertical version. Allows one to create, install, uninstall, and extract libraries, as well as to change a library's ID number. 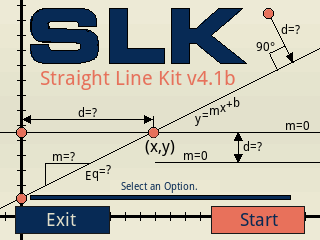 Helps you to find the distance, the slope and the equation between two points, the perpendicular distance between a point and a straight line, collinearity of three points (the middle-point and the end-point coordinates), the equation of a straight line that goes through a point with a slope, transforms linear equations back and forth between standard and slope-intercept forms, generates the coordinate representation of a straight line, determines whether two straight lines are parallel or perpendicular, finds the (x) & (y) intercepts of a straight line, finds the intersection point of 2 straight lines, transforms a non-standard form equation into a standardized form of it, divide a segment into points or sub-segments, performs linear interpolation/extrapolation. Requires firmware 10077 or higher.